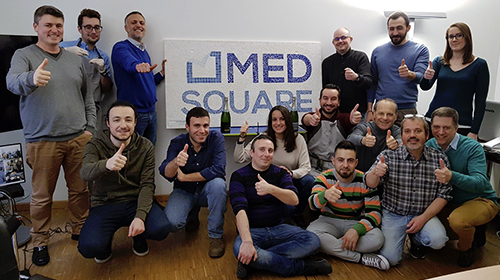 From 16 – 18 January, on the occasion of the 2018 kick-off meeting, Medsquare was pleased to invite its employees to announce the official start of the New Year. A special opportunity to review the past year, to zoom in on the different departments, and to set objectives for 2018. This year, Medsquare gathered its employees around several activities: sports team games and a mosaic workshop creating Medsquare’s logo. Each employee realized part of Medsquare’s logo fresco with precision and meticulousness. The group artwork was proudly displayed in the company, as a symbol of synergy and unity of work.